Hear Our Ad On TV Or The Radio? Is water "wet" or "dry"? Please answer the above question so that we can be sure you are a human being! 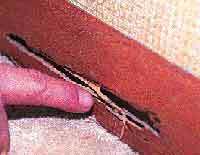 In eastern coastal areas of the US, drywood termites are common. Drywood termite swarmers differ from subterranean termites in appearance primarily in color. 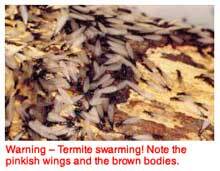 Drywood termite swarmers are red with red-blackish wings - and can be confused with carpenter ants. Subterranean swarmers are dark brown with pinkish, whitish or yellowish wings. For more on subterreanean termites, select this link. When a colony has existed for about 5 years and has become well-developed, the Queen gives birth to "Winged Reproductives" (both male and female). These are the termites you may actually see during "swarming season": usually March through June. After shedding their wings, reproductives pair off, burrow into the soil and begin new colonies. Unfortunately, the swarming phase lasts only a few hours, since termites can't fly well. Unless you actually see the swarming, or find discarded wings on doorsteps, in sunny spots, or on window sills, you will probably miss it. If you do not see signs of swarming, then there are other signs that you can look for. The most obvious sign of subterranean termite infestation is mud tunneling. Subterranean termites build mud shelter tubes in which they travel. These mud shelter tubes are connected with the termite colony and are constructed of dirt and an acid substance that the worker termites secret. The mud shelter tube helps to protect the worker termites from predators such as ants, and also provides them with humidity. Most importantly, mud shelter tubes give the blind worker and soldier termites a highway in which to travel to and from their food sources. Mud shelter tubes are very hard packed, and usually as they get older, they get harder and larger. Some mud shelter tubes are as small as a pen, while others can be several inches wide. Mud shelter tubes are usually seen on the outer sides of foundation walls, but they can come up through any foundation! They can also be seen emerging from sheetrock in ceilings, and on sheetrock walls. How to tell a termite from an ant. Why termite control is necessary. What a "termiticide" is and how it works. 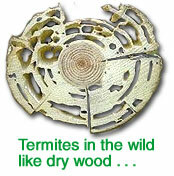 Frequently-asked questions (FAQS) on termites and termite control. Legal definitions of termite control. 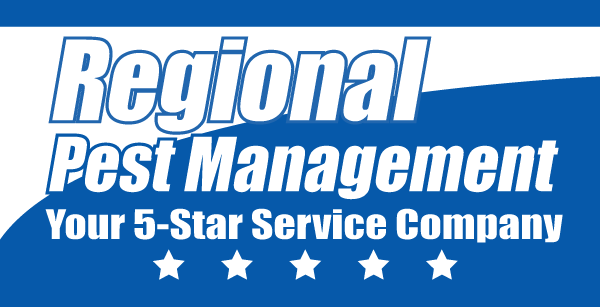 Regional Pest Management - Your 5-Star Service Company. Serving Maryland, Delaware, Washington, D.C., and Northern Virginia.